96 Pts (WS) - This wine has great intensity and complexity. Rich, ripe dark fruit and pepper and spice palate. Deep, dark red colour. Big, rich spicy blue & blackberry nose. Great intensity and complexity. Rich, ripe dark fruit and pepper and spice palate. Big, mouthfilling tannins. Slightly sweet fruit comes out as the wine opens up. Drink 2014 to 2021. Best with a thick chunk of steak on the braai. 96 Points - Wine Spectator. Handpicking into 20 kg crates. Destemming and gentle crushing directly into small 2 ton open top fermentation tanks. Spontaneous natural yeast fermentation @ max. 31°C with the cap of skins punched down manually 1 – 4 times a day for 14 days. Wine drained directly to barrels together with single pressing from traditional basket press. All red wines undergo malolactic fermentation in the barrel. 50% new fine grained, slow toasted small French oak was used. Time in barrel 20 months with only 2 gentle rackings. This wine was bottled unfined and unfiltered by hand. 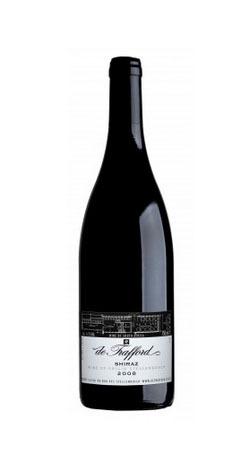 De Trafford Winery is situated on the beautiful Mont Fleur farm set at the top of a dramatic valley above Stellenbosch, 380m up between the Stellenbosch and Helderberg mountains, right at the end of the Blaauwklip road, between Stellenbosch and Somerset West. The history of wine growing on this mountain farm started with the purchase of the property in 1976 by the Trafford family as inaccessible grazing land. Many of the high altitude slopes were deemed suitable for high quality red grape varieties. Unfortunately, due to the absurd quota restrictions, planting a commercial vineyard had to wait 18 years. In 1983 a small vineyard was established to produce experimental wines – consumed by family and friends! These were our learning curve years ( 1984 – 1991 ), which included lots of help and advice from local winemakers and working experience in France, particularly in the Bordeaux area. From Dr. Zin of La Porte City, Iowa on 4/13/2017 . I can't get enough of this wine. It is a one of a kind Syrah. This wine opens up so much from the first to last drink you would swear you are drinking 2 different excellent vintages. You savor every drop because some day, it will all be gone. Hopefully the next vintage is as good. From Wine Spectator of New York, California on 8/2/2016 . Gorgeous, with a layers of luxurious blackberry coulis, plum sauce and warmed fig notes, layered seamlessly with the polished structure. Dark ganache, melted black licorice and tar details provide a perfect backdrop. Everything flows beautifully through the finish, where a smoldering dark tea accent lingers alluringly. Best from 2016 through 2022. 56 cases imported. From Platter&#39;s of San Francisco, California on 2/22/2016 .